After we introduced the Castles and Abbeys collection last week, two more new tiles for this collection successfully made their way out of the kiln. Look for more coming soon! Learn more about this collection. Interested in samples or more information? Contact us. 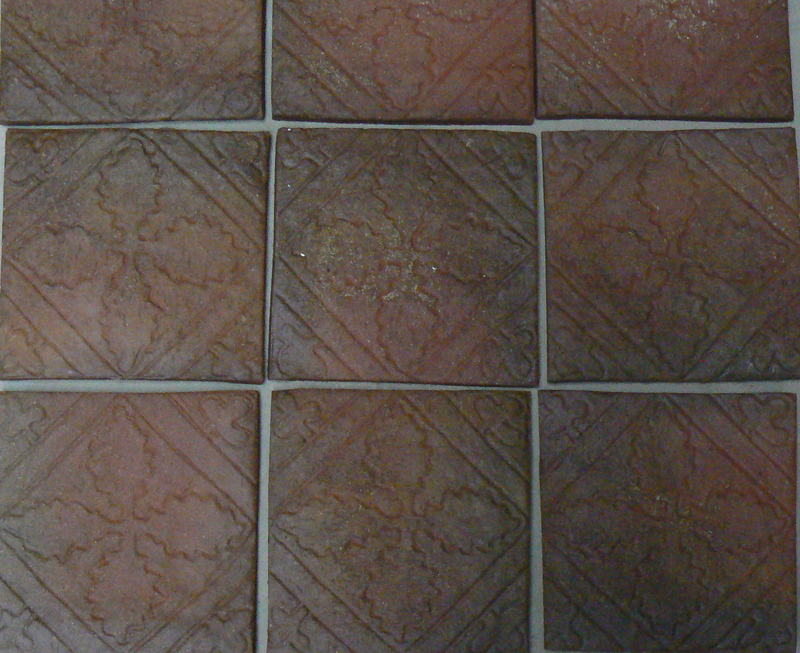 The Castles and Abbeys collection tiles will be for sale starting this fall! 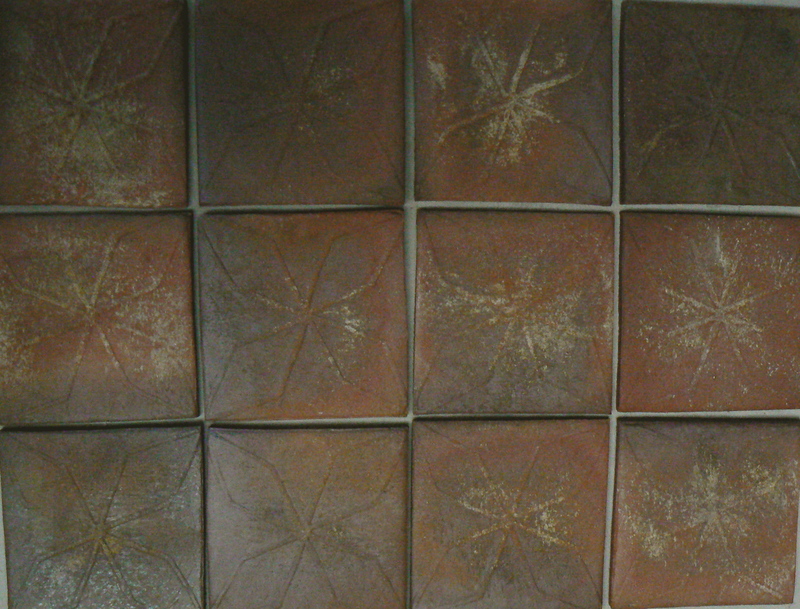 These raised low relief tiles match the design of four late Saxon tiles evacuated from the All Saints Church in York, UK. 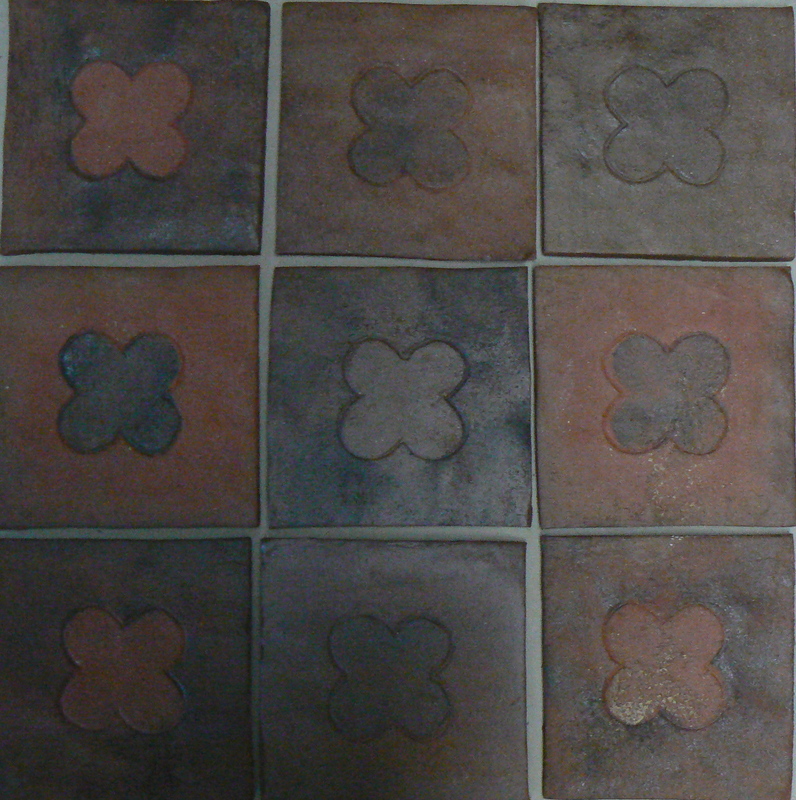 The original red clay tiles were either used as step risers or as flooring in the church, and are the oldest surviving examples of medieval ceramic tiles in northern Europe. The diamond-shaped lozenges decorating this tile were a popular Christian symbol in the Middle ages, though scholars remain uncertain what the shape was meant to represent. Our All Saints church Lozenge tiles display the low-raised relief design on 6 inch squares. This attractive line-impressed Oak Leaf motif comes from the 14th century Acton Burnell parish church in Shropshire, UK. In medieval times, oak leaves symbolized many desirable traits, including hospitality, stability, strength, honor, eternity, endurance, and liberty. Oak leaves were also associated with power and victory, making them commonly incorporated into heraldic imagery. This specific tile design, however, being laid in a church, was likely created to embody the religious symbolism of the Middle Ages–strength, renewal of life, and steadfastness, especially in times of persecution. Oak trees were also sacred to ancient Druids, as their Tree of Life, and may have been incorporated into Christian symbolism as a way of assimilating many Celtic peoples into the church. Our 6 inch Oak Leaves tiles are line-impressed, like the originals, and can be used on their own or mixed with plain field tiles to add a regal, historic look to your floor. Posted in New Products, The Castles and Abbeys Collection, Tiles and tagged Castles and Abbeys Collection, ceramic tile, Lozenges, Medieval Europe, Medieval tiles, Oak leaf motif on August 13, 2008 by Inglenook Tile Design. Medieval times, rich in mythology and romanticism, have long captured our imaginations. 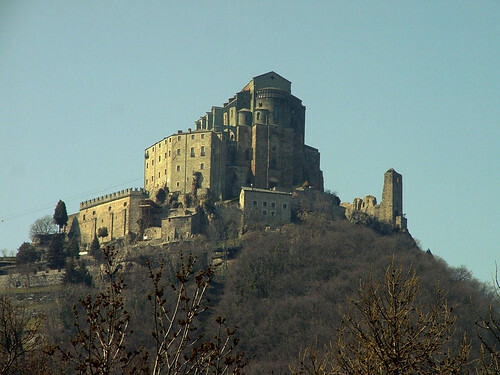 Ruins of castles and other majestic structures dot the hilltops of modern Europe, reminders of their storied past. In the medieval buildings left standing, we can catch a glimpse of these stories and the beautiful architectural details that graced them. Tiles in medieval Europe were a luxury, enjoyed by those who could afford them. Patronage for medieval tile makers came from the church and clergy, the aristocracy, and well-to-do merchants. The subject matter was simple: the ever-popular fleur de lis, floral motifs, heraldic emblems, and religious themes. Animals were imbued with symbolism; a lion, for example, embodied courage, power, and resurrection. 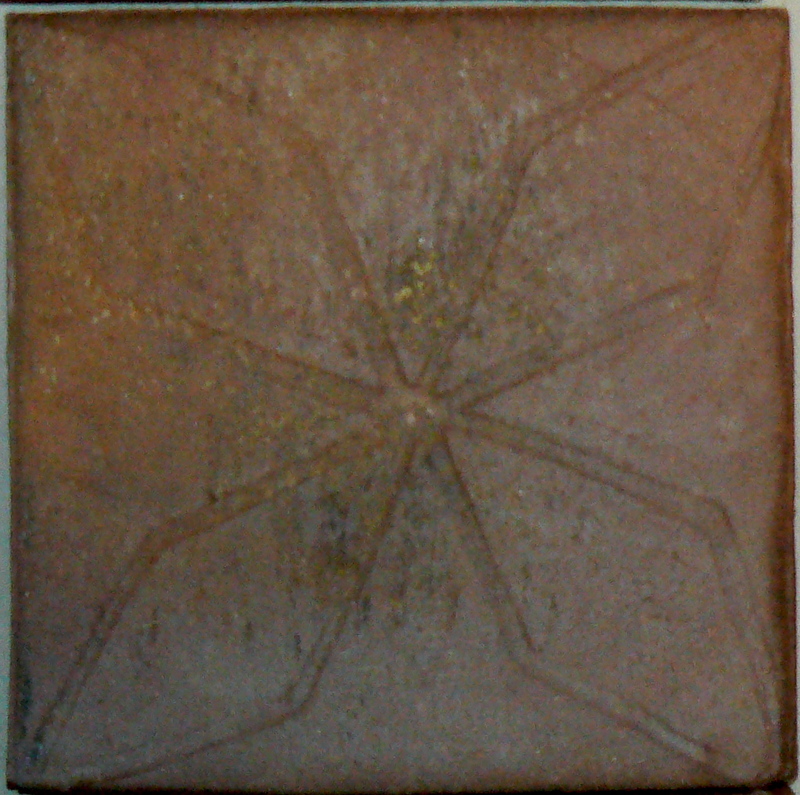 Tilemakers often etched or inlaid these distinct tiles designs into wet clay. Mosaics, raised low relief, sunken counter-relief, and line-impressed designs are also found in medieval buildings across Europe. For our Castles and Abbeys collection, we have gathered tile designs from European castles, abbeys, and cathedrals and re-crafted them for today’s home. We will provide details of the origins and inspirations of each tile design in this collection, allowing you to know and to share your floor’s story. This tile design originates from the elegant twelfth-century tiles found in the Chapelle de Saint Cucaphas in Saint-Denis, Paris. On the original, the classic quatrefoil motif, a design representing a flower or leaf with four leaflets, has been inlaid into the larger square and painted black and warm yellow to create a dramatic contrast. We have reproduced this timeless tile design on 6″ square tiles and etched the quatrefoil into its surface. We then set the quatrefoil design apart with sprinkled manganese to create a subtly contrasting black and earth-toned mosaic. These etched squares interlock to create an understated pattern of leafed foliage and scrolls, borrowed from 13th century inlaid tiles found at the Rievaulx Abbey in North Yorkshire, UK. The Gothic stiff leaf motif created by the repeating pattern was popular in early English ornamental work and remains an attractive choice for the modern home. Our Rievaulx Abbey Scrolls are line-impressed on 6″ tiles and fired in our gas kiln, giving the floor tiles a graceful design and rich color variation. Watch for more tile designs from the Castles and Abbeys collection, coming soon. 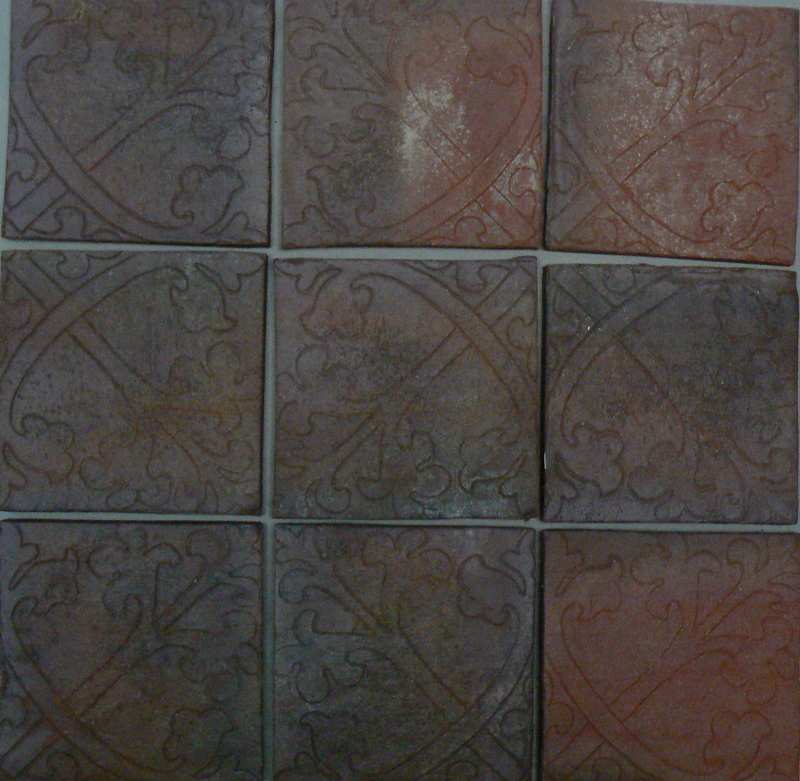 The Castles and Abbeys collection tiles will be available for sale starting this fall. Call to pre-order samples and to receive more information.